Toepen is a Dutch fast paced, Dutch trick taking card game that can be played between three and eight players. Toepen is widely regarded as a drinking game in Holland, but can be applied as a real money card game too, with professional Toepen tournaments not out of the ordinary around the world. Toepen is played with a 32 card pack. To set up a regular deck of playing cards for a game of Toepen simply remove all of the two, three, four, five and six cards of each suit. In descending order of value the high card is 10, nine, eight, seven, Ace, King, Queen and Jack is the lowest value card in a Toepen deck. The dealer will deal one card each to the players in a clockwise fashion until each player has four cards. The remaining cards will be placed face down in the centre of the table. 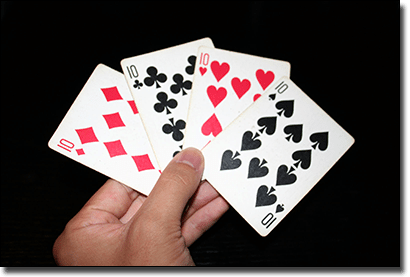 If any player’s four cards consists entirely of Ace’s, King’s, Queen’s and Jack’s, then that player has the option to surrender that hand and deal themselves another four cards from the cards in the middle of the table. In fact, anyone can surrender their hand and deal themselves four new cards, regardless of their hand. But if some else at the table challenges your surrender then you have to reveal the four cards you are giving up. If any of your cards actually contain a 10, nine, eight or seven, then you lose a life. But if your cards really are only Ace’s, King’s, Queen’s and Jack’s, then the person who challenged you loses a life. The player to the dealer’s left starts the first trick of the game by determining the suit of that trick with the first card they put down. Play continues in a clockwise fashion with each player following suit if they are able. The trick is won by the player to put forward the highest card of the suit being played. At any time throughout the hand any player can elect to “toep” or increase the number of points that round of play is to be worth. This is done by simply knocking on the table. Once the toep has been raised, every other player may elect to either fold and lose one point or continue playing at the elevated point total. The winner of each hand does not lose any points while all those remaining in the hand lose however many toeps plus one point. If there were two knocks throughout the round then the losers of that round would lose three points, the initial point of play and the two toeps. The winner of a trick starts the next trick and the winner of the fourth trick deals the next round. Once a player loses ten points they are the loser and out of the game and either lose money to the pot or buys a round of drinks. A fresh game, with all accrued points wiped, can now begin.